Appetite Suppressants that are FDA approved for treatment of obesity are Phentermine, Diethylpropion, Bupropion, Phendimetrazine, Liraglutide, and Lorcaserin. These suppressants are prescription medications. A prescription from a doctor is needed to buy these. For more information about these visit FDA approved appetite suppressants. There are many natural over-the-counter appetite suppressant alternatives on the market that are categorized as dietary supplements and these are not evaluated by the FDA. Some of these dietary supplements are: 5-HTP, Inulin, Biotin, Inositol, and Rose Hips. These are 100% natural plant extracts that have been shown to suppress appetite clinical trials. These 5 extracts are formulated into a natural product called Skinny Piggies. 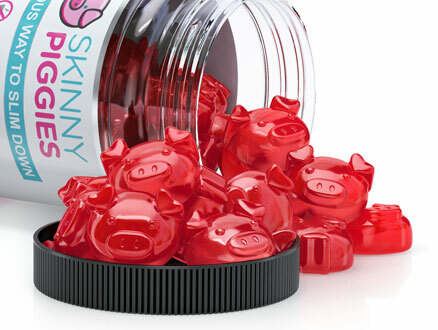 Skinny Piggies are delicious gummy supplements that help suppress appetite naturally and promote healthy weight. Do you like eating flavorful dishes but also wish to shed some pounds? Burning fat is about creating a negative caloric balance which means almost certainly you'll feel hungry night and day. Fortunately, there is an original product that can change that: Skinny Piggies. What's Skinny Piggies? Let's understand what fat loss is. For you to achieve this caloric deficiency, you want to either boost your burned calories through added physical activity or eat less calories. In order to get the greatest results, you may want to do both. Skinny Piggies help you eat a lot less and lessen your caloric intake which makes achieving loss of weight easier. Include an extra regular exercise to help step up the weight loss process. Hold up though. That sounds great in theory, but when you begin cutting calories and carbohydrate cravings will set in, in addition to hunger that is hard to bear. This is what Skinny Piggies are all about. These fun, tasty otc appetite suppressants are produced to not only help you stop the food cravings but also enable you to stick to your diet by helping you feel full. Appetite is mostly driven by two ways: caloric consumption and the feeling of food in the stomach. When you eat a meal, your stomach becomes full and the food stretches the stomach walls. That is what creates the feeling of being full and you stop eating. When you start taking Skinny Piggies before eating lunch or dinner, you trick your stomach into feeling fuller, faster. Taking a Skinny Piggy with a tall glass of water 30 mins before eating lunch will cause it to expand in your stomach so that it takes up space and makes you feel you just ate a substantial meal. This way you can lessen appetite and hunger, food cravings, and eat less, without feeling hungry all the time. When you use the Skinny Piggies otc appetite suppressants before eating, it form a soft gel coating around your food, which slows the release of the carbs into the blood stream. That helps keep your blood glucose stable and makes sure your body stays in fat-burning mode for many hours. It can even make your workouts feel better. You could be wondering, what's so special about Skinny Piggies compared to some of the other fat loss gummy products you've seen before? First of all, Skinny Piggies have no artificial ingredients. Take a look at your average weight-loss product and you'll find a whole line-up of chemicals. Wholesome Ingredients: In addition to helping you lose fat, they also help the healthy hair and help your skin look healthy. Genuine Ingredients: Unlike other diet supplements, it's actually easy to pronounce all ingredients in our gummy supplements, knowing that you're nourishing your body with high quality nutrition. No Harsh Stimulants: Taking a weight loss supplement with no caffeine and that's why you may take them at bedtime, and our gentle formula means that Skinny Piggies are OK with sensitive stomachs. Delicious Taste: Very few diet supplements taste great, and none have the same mouthwatering taste of strawberries, that's why our gummies are a snack you'll enjoy. Losing body fat is not easy, but delicious Skinny Piggies are ready to make your efforts more easy for you. You'll love the fruit flavor of our otc appetite suppressants so much, remembering to take them every day won't be a problem. Skinny Piggies are dietary supplements that is delicious and fun to eat.